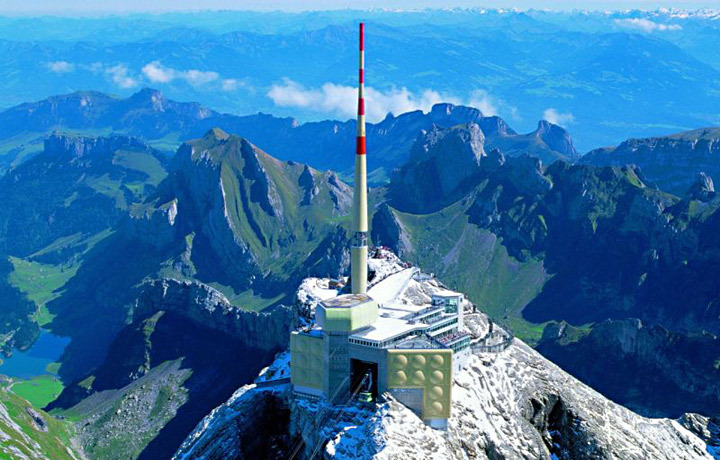 Säntis 2000 expanded the tourist and communication facilities on Alpstein massif. 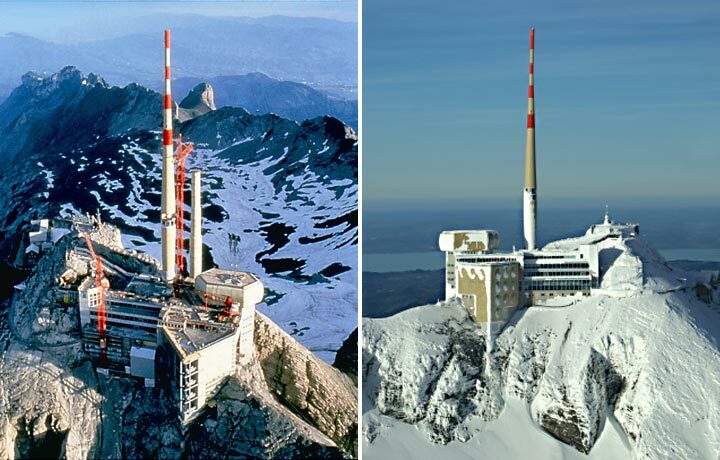 The Säntis 2000 project renovated and expanded the communication and tourist facilities on the highest peak of the Alpstein massif in Switzerland and during construction was the highest building site in Europe. The project specified Polybutene-1 piping because of it's lightweight, ease of installation and resistance to cracking under freezing conditions. Not only the special weather conditions, but also the client's conditions exerted considerable influence on the execution of the construction work. One of those was the stipulation that the cableway would remain in operation throughout the period of construction. The safety of the tourists and their freedom of movement had top priority. This complicated the work procedures to some extent. For one thing, transportation logistics had to be given considerable attention, since all of the materials and the people had to be transported by cableway. The use of helicopters was allowed only in special cases and required the client's written permission. Also, the leftover building materials had to be packaged in transportable units, brought to the valley, and correctly disposed of according to regulations. The extreme weather conditions and the difficult accessibility defined the exacting criteria for choosing the drinking water installation system. 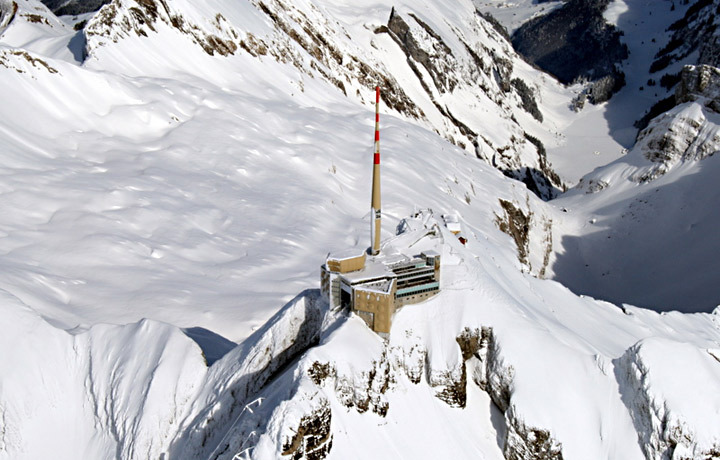 The engineering firm of Jörg Alder in Herisau was assigned the job of planning the domestic installations for the Säntis 2000 project. Because the Säntis peak stands isolated in the Alpine foothills, the climatic conditions are very extreme comparable to conditions at over 3000 m in the high Alps. In order to be self-reliant, reservoirs of water for drinking and extinguishing fires are available, having a capacity of 500,000 litres. The surface water is treated in a treatment plant to be used as drinking water or fresh spring water is brought to the summit by cableway from the alpine meadow of Schwägalp. Numerous considerations led to the selection of the drinking water system. The criteria were both diverse and demanding. A corrosion-free system was necessary, not only because of rainwater treatment and the quality of such water, but also because of the danger of corrosion damage due to particles being washed in from the galvanised steel pipes, which have not been renovated. The extreme weather conditions, with lowest temperatures around –30°C and wind speeds up to 200 km/h, made the problem of frost protection a major preoccupation. 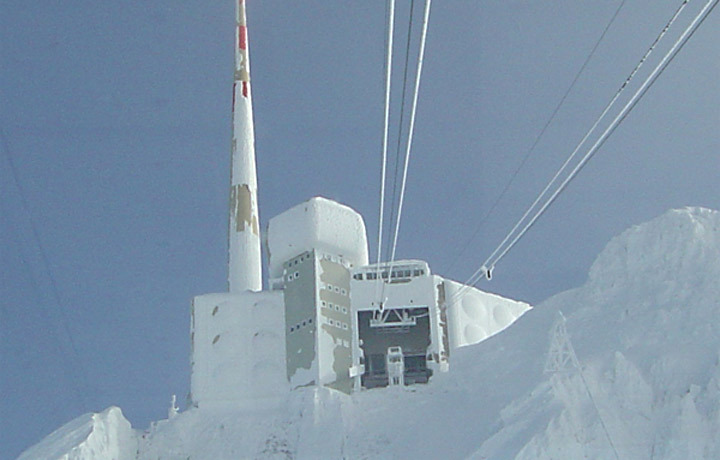 In January 1997 the frost resistance of the Polybutene-1 INSTAFLEX system was tested on the summit of the Säntis. Various test pieces were filled with water, put under a pressure of 5 bar, and exposed to the extreme weather conditions. This field test on the Säntis revealed beyond doubt that no negative effects would result for the safety of the piping system if the Polybutene-1 (PB-1) installation froze. Thomas Dörig, member of the engineering firm Jörg Alder and responsible for project planning, remarked on his experience: "All of the drinking water installations, from the manifold in the central station, to the all-PB-1 valves, to the last tapping point, were planned with the PB-1 system and executed using a uniform jointing technology. With so many interlocking parts in the piping network, the working space was often a bit tight. 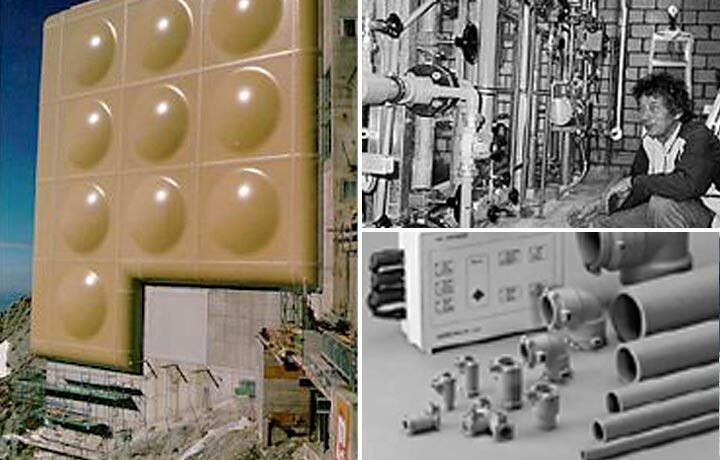 Especially in the drinking water plant, with very little elbow room, the PB-1 system with all of its possibilities solved a lot of our problems. It's also worth mentioning that all of the ceiling pipes could be planned for every dimension without compensators, flexible sections or expansion loops." Albert Singer, from Sulzer Infra Ostschweiz AG, responsible for installation: "For us it was the first big construction site with the PB-1 system. But unlike all the imaginable adverse scenarios, the drinking water installation with Polybutene-1 piping came off without a hitch. With the technical support of the GF Piping Systems sales representatives, the installation of INSTAFLEX PB-1 was fast, simple and rational. The enormous flexibility of the Polybutene-1, along with the low weight of the pipeline, made it possible to prefabricate long sections with the reliable z-dimension method. With the precise INSTAFLEX fusion machines, prefabricating pipeline sections of up to 30 m long was no problem, even in bigger dimensions – the measurements are precise down to the millimetre. The flexible and lightweight segments of pipeline were easy to transport and fairly straight forward to connect by automatic electrofusion even when lacking ideal space conditions. With fixed mounting, it was possible to install the many long PB-1 segments without expansion loops and compensators, in a version that turned out to be amazingly simple. 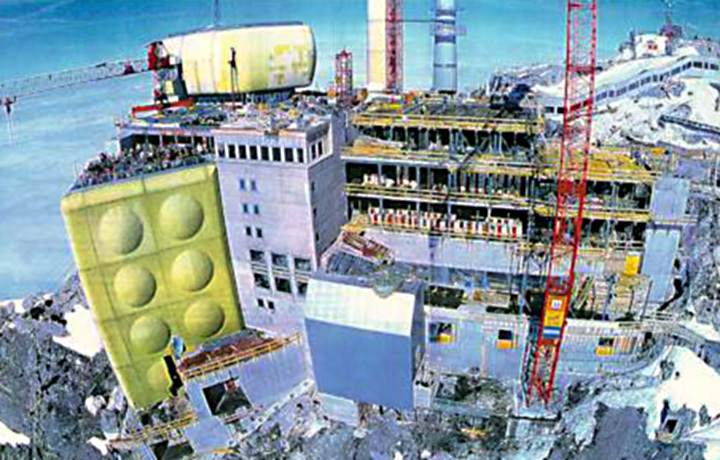 The correct installation with the Polybutene-1 system permitted a fastening distance of 1.50 - 2.00 m. Here the factor of the small expansion force of the PB-1 material became important. The key to rapid installation with PB-1 piping lies undoubtedly in correctly carrying out all the steps of prefabrication. From our experience on the Säntis, we can confirm that even when ceiling pipes are involved, the installation with INSTAFLEX is not excessively time consuming."